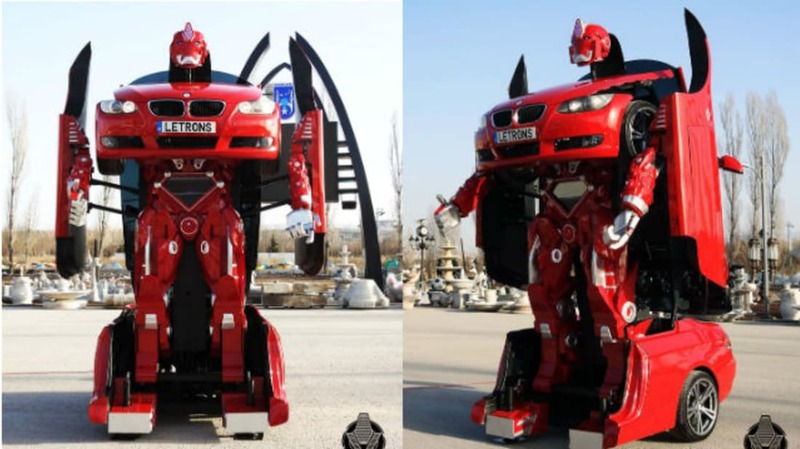 Despite significant technological advancements in recent years, no one seems focused on what should be a priority: making a car that can transform into a towering, vengeful robot. Letvision, a company based in Turkey, is looking to change that. They’ve just demonstrated a functioning BMW automobile that can morph into a humanoid at the touch of a button. Dubbed “Letrons,” the car-bot is obviously paying homage to the Transformers, Hasbro’s long-running toy and feature film franchise. Unlike those CGI and plastic counterparts, however, Letrons transforms very, very slowly and cannot walk or shoot weapons, though it will belch smoke to confuse your enemies. It’s also a non-passenger vehicle that can be driven only at modest speeds via radio control. Still, it’s a start. Letvision designed the prototype with the hope of eventually making mass-market machines for collectors with significant disposable incomes. Expect Letrons to wind up at a comic convention near you in the near future.